All over Sumba people live in houses built in traditional Sumbanese style with thatched roofs, peaking in the middle to the sky. These houses are still being built nowadays with traditional materials. The villages are alive, meaning that local people do not abandon these villages to live in the cities. 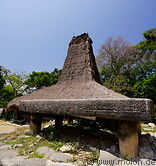 This is quite impressive and shows the importance of traditions and local culture on Sumba. Prainggoli and Wuntalaka are small villages located along the southern coast, while Tarung is a pretty large settlement with houses built in traditional Sumbanese style near Waikabukak. 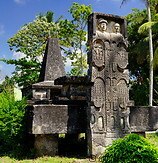 The Manuakalada village lies in northern Sumba.